Winter has arrived this week and with it a dose of a cold for me. I am feeling pretty miserable and the weather doesn't help. I am sure it is close to snow outside it is sleety and freezing cold. I left work at lunch time today to put my PJs on and snuggle up under a quilt with the fur babies to rest up. I have been working on another block in my Garden Treasures quilt. It looks sweet even from the back. I just love stitching pretty flowers they always seem to feature in my designs. I have a giveaway for you over the weekend so be sure to check back in. Oh my, as I read your comments on the cold, snowy weather on your side of the world I am thinking that today is supposed to be 80 degree F here in Philadelphia, USA. I work better in the nice temperate zone weather...neither too hot or too cold...lol. I hope you feel better soon; a good nights sleep ought to do the trick! So sorry you're not feeling well. I'm not sure whether to say it's a good thing it's almost the weekend so you can rest up, or too bad you have to be sick over the weekend! Hopefully you'll at least feel like continuing to stitch. Feel better soon! Rest up and take care. Hope you are feeling better soon. Lovely stitching. So sorry to hear you are not feeling well. Here on the flipside we are finally getting some warmer weather. It started to feel like winter lasted forever! Nothing like being miserable when the weather is grey..... Drink loads of tea with honey, eat chocolate (medicinal of course) and feel better soon! So sorry to hear you are not well. Nothing is better than pj's and fur babies for comfort. That's how I spent yesterday too. 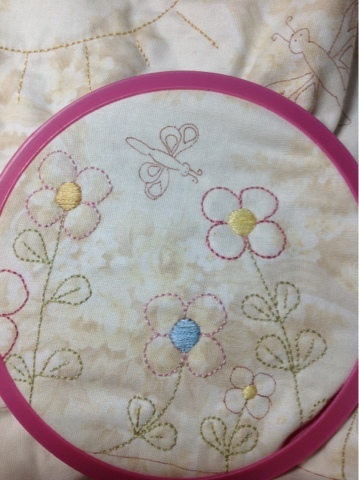 Keep warm and keep stitching, those flowers look very cute! Best thing for a cold is REST! 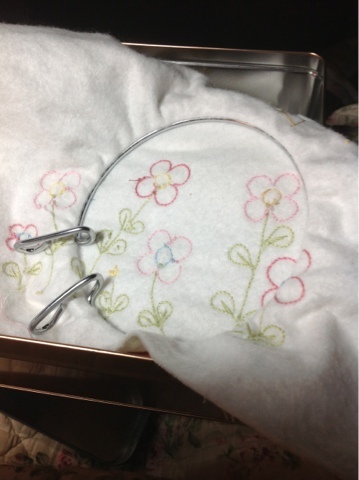 such pretty stitchery.... hope you feel better soon! Hope you're feeling a bit better today Fee although it's perfect weather for snuggling under quilts today. Stay warm sweetie! NO fun being sick, but snuggled under a quilt with fur babies & sewing - that sounds good. !